“My birthday is 11/25/1981 and I am a textbook Saturn in Libra. This spring I started having severe anxiety, sleepless nights and problems at work. I felt depressed and sluggish. My relationship of 3 years had grown stagnant and it was like pulling teeth to get him to talk about our future. I started having crying spells and couldn’t shake the feeling like something wasn’t right. One day I randomly googled “turning 30”, thinking my anxiety was coming from getting older and I discovered the Saturn Return! After reading “Surviving Saturn’s return” I discovered that Saturn went into Libra late July of 2010. I looked in my diary and literally one week after this occurrence I had my first anxiety-filled crying fit to my boyfriend over the phone. A few weeks after that I came down with appendicitis… related somehow? Only the cosmos knows. This spring I finally came to terms with the fact that I had to end my relationship even though I still cared deeply about my boyfriend. I broke up with him when I was 29 1/2, almost to the day. Now I’m so much more at peace and embracing my life as I sail towards the big 30! 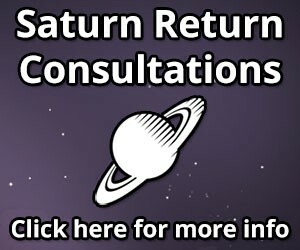 The Saturn return in general often encompasses major decisions about important relationships in one’s life, given that it is a time of soberly re-evaluating all of one’s life structures. As Saturn transits the sign of Libra this is emphasized even more, as one of Libra’s themes itself is relationships, being a sign ruled by Venus. Thus, for those born with Saturn in Libra in their birth charts, relationship issues and decisions will take on extra importance during their current Saturn returns. We posted about Christina Aguilera’s divorce previously, which happened as Saturn transited the early degrees of Libra. Finally, the reader who submitted this story also has Saturn square Venus in her natal chart. Venus is, again, the general significator for relationships, and any other planet that is aspecting Saturn in one’s birth chart will also have its themes pulled into the Saturn return experience. In a full natal chart consultation one would look at what houses Venus and Saturn are ruling, etc., in order to get the full picture, but even without an exact birth time you can count on the general significations becoming relevant. Thank you to our reader who sent in this story, and we wish her well during the rest of her Saturn return! My first Saturn return in 1974 through 1976 was a nightmare. I have several planets in the 20 degree range of Cancer, Capricorn, and Libra. I got whammed for about 2 years straight as Saturn rolled back and forth. I had love and health problems, and now look where Saturn is!! It is in the 20 degrees of Libra, setting off my T-square, and I am having back trouble and nerve damage, and filed for a divorce a year ago. Saturn can set us free if we let it–I was extremely unhappy with my marriage. When Saturn rolled out of my 5th House of love relationships last October, I filed for divorce a week later. I feel better for that, and needed a job, too. I got the first job I applied for–teaching GED prep at a community college! As for my health, I am seeking treatment and have no doubt that I will be OK once Saturn goes into Scorpio. Now, of course, I have Saturn in my 6th House of health and work. My life will be easier now that Jupiter is in Taurus. It seems Jupiter always comes along to “save” me when I need it most. Thanks you for this site. I have moon in Libra in my second house, Venus in Aquarius- I’m an Aquarius ascendant, Saturn in Sagittarius- I’m a Sun Sagittarius- and I don’t know how much longer I can take this Saturn thing!! Saturn in Libra was hell in my second house, Saturn in Sag just started and my roommate moved out, three deals that would have put me on the beach for the holidays fell apart, and now I’m house cleaning (back-breaking work!!) to make ends meet. I broke up with my boyfriend of more than 10 years when Saturn was in Libra ( He was Libra sun-sign)and please don’t tell me Saturn will enter Aquarius after it leaves Sagittarius cause I can’t bear the thought of another 2.5 years of this. Please give me some insights on how to make my 2nd house work in my favor or if Prince Charming will come and rescue me!! I could use some good news, PLEASE! !